On Second Scoop: Ice Cream Reviews: M&M brand ice cream direct from Mars! 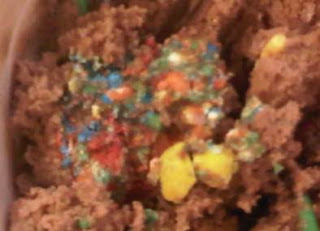 M&M brand ice cream direct from Mars! [New for 2010] Oh man was I excited by my discovery today. I went into walgreens to pick up some vitamin type stuff and as I was walking out I actually didn't even look at the ice cream.... but something made me turn around. I did a quick look and the word SNICKERS caught my eye. Wait, weird, what's that? I went over and sure enough there was a pint with a big SNICKERS logo on it. At first I thought it might be breyers but then I looked closer. SNICKERS "Real vanilla ice cream with real snickers chunks" or something like that. Sounds interesting, but I think I'm still full from lun.... WAIT, WHAT?? M&M's Ice Cream? 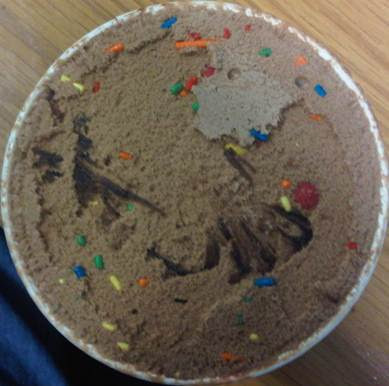 even better, it's CHOCOLATE ice cream with M&M chocolate candies! I can't turn this down! I grabbed the pint and ran for the door. Oh man, I cant wait to open it! HAHAHAHA! SPRINKLES!!! I think I'm in love. mmmm, frozen mini M&Ms. ok technically I was hoping for full size M&Ms, but frozen minis are probably better for my teeth. sprinkles aren't adding anything physically (taste or texture), but they are so much fun to look at. I really dig that the sprinkle colors match the M&M colors. mmmm, 3 M&Ms in one bite. very solid. definitely like the milk chocolate flavor of the base ice cream. wish I had a spoon, this plastic fork is making things a bit difficult. ice cream texture is a bit weird....ok, here's a description: the chocolate ice cream tastes like the kind you find in an ice cream cake. actually, the whole thing kind of reminds me of an ice cream cake. hmm, 30% sat fat per serving... must resist urge to eat entire container. swirl is intermittant, but I seem to hit mini M&Ms on most scoops. ok, getting full, time to put my new friend back. Hmmmm, now I wonder who makes this ice cream? [Update: Mars is! Using their Dove Pint Prowess] This texture is kinda funny. More than anything, this tastes like some funky fun M&M ice cream cake, but, that throws me off as to who might be making it. There is a label of "plant number 05-50" on the container. Is it possible it's using Walgreens ice cream as a base? I just don't know. Looking at the M&M website, it technically could be Carvel or Breyers (to be honest, I can't remember if I've ever seen the Breyers M&M ice cream). Parting thoughts: It was just awesome to find M&Ms in a pint size container. It's not perfect, and I've had it local before, but it's cool to know I can put a pint in the freezer. I think it has a decent amount of M&Ms, though I wouldn't argue if they wanted to throw a few more in. Lastly, I know it's silly, but the sprinkles really did put a smile on my face. Life is hard, you really need to let the little things make you happy. Side Note: To make this story a little sweeter, the other stuff I picked up was buy one get one free for some reason, dont ask me why, and I dont care, I saved a ton of money today. I guess this makes up for the honderous lunchtime snafu yesterday where I tried to help out a situation but made things worse. Hey, I meant well... Karma Rocks! On Second Scoop: Well, I just decided to have dessert before lunch and while I am satisfied with my treat, I must admit that the fun factor here is definitely stronger than the overall texture. I'm still kind of getting an ice cream cake vibe, though it has subsized a bit. Don't expect super premium style ice cream, but this isnt some cheap air fluffy stuff either. I still say give it a try! 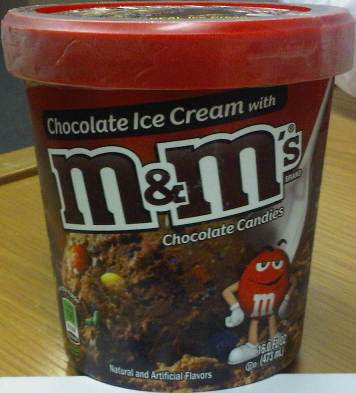 So I just bought this M&M's ice cream last week, and I'm already craving it again! Soooo good. I haven't found it anywhere else, and the m&m's/ mars site doesn't say anything about it. I love sprinkles! This ice cream is my absolute favorite!!! They sell it at 711 too (that's where I get it)! I've been looking for it in the half gallon containers, but have had NO luck! I don't think it's Breyers...it's def. MARS...they need to sell it in a bigger size ASAP! lol! Its awesome! I totally agree -- tastes just like ice cream cake. I was very happy not to have to drive to McDonalds to get my little girl a McFlurry which she was begging me for til we saw this. Hey, chocolate ice cream is better any day. And what's really good about this too is that the M&Ms taste like M&Ms -- they don't have that hard, weird, plain, waxy taste that they do in the McFlurry. 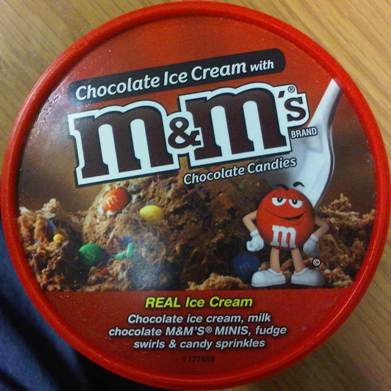 ONDE EU COMPRO ESSE SORVETE M&M'S ? POR FAVOR PARECE SER MUITO GOSTOZO .